It’s that time of year: the time where holiday guests descend upon our homes in droves! As much as we love getting together with friends and family, we can’t deny the affect that all this merrymaking has on our fur kids. 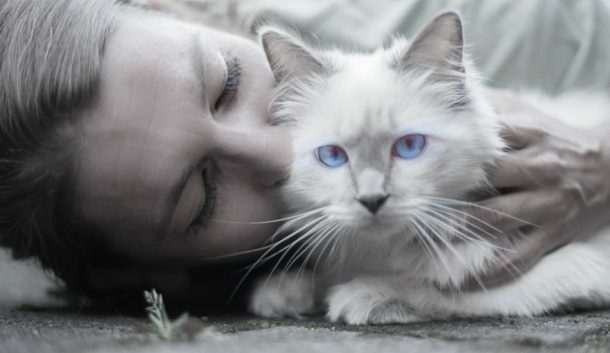 While you can’t (and shouldn’t) force a kitty to be a social butterfly, there are some things you can do to make the visits less stressful on both of you. 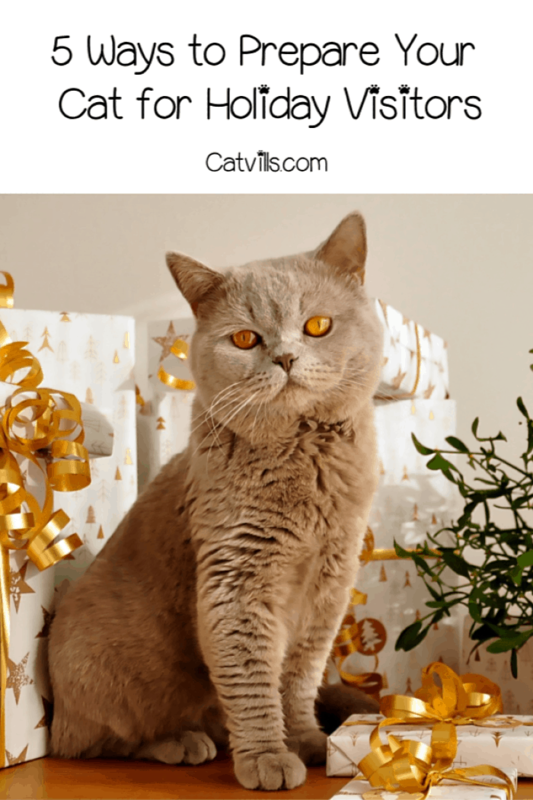 Read on for five ways to prepare your cat for holiday visitors! Before we get into these simple ways to prepare your cat for holiday visitors, I need to tell you a funny story. 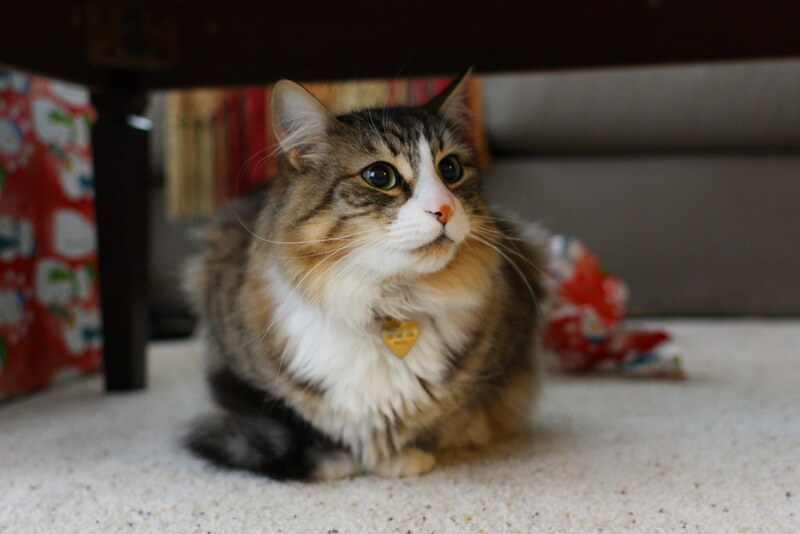 We adopted a somewhat skittish kitten right before Christmas. It took her a long time to get used to us, and she did not like new people at all. My brother and his wife came to visit for the holidays. When they arrived, our kitten (Prue, pictured above as an adult) vanished into thin air. We were so concerned with her disappearance that, rather than sit and visit with my brother, we spent hours scouring the house in search of her! She was fine, of course. She found a safe little hiding spot and curled up there. Since she remained skittish throughout most of her life (we lost her last year, she was 15), we had to take extra measures to make sure holiday guests didn’t completely freak her out. Here’s what I recommend if you’re in the same boat. If you have a particularly skittish cat, it’s super important to talk to your guests before they descend upon your home. We let our friends and family know that while two of our cats were perfectly content to be admired and adored, Prue was off limits. We also let them know that the safety zone (more on that below) was also off limits. Let’s talk about that safety zone I mentioned above. Depending on how much space you have in your house, it could be an entire room or a small section of one. For example, my bedroom is my cats’ safety zone. You’ll want to put all of the essentials in there so your kitty doesn’t have to leave their safe area. Food and water are a must. I suggest moving a litter box into the safe zone, too. We learned that when we noticed that Prue wouldn’t even come out to use the box. I think she “held it” the entire time! Cats LOVE new things to lay on. I have three that go crazy anytime I bring something new into the house, be it a fancy cat bed, a new cat tree, or even a plain old cardboard box. I can’t even tell you how long I’ve had to leave boxes on my dining room floor, waiting for my cats to get bored with it. I recommend grabbing a new bed (it doesn’t even have to be expensive or anything) and placing it in their “safe zone” the day your guests arrive. That way, they’ll have a brand new place to cozy up and sleep until they feel like it’s safe to come out again. For a particularly anxious cat, you might want to consider either a Thundershirt or a calming diffuser . My cat did not like the shirt, so we went with the diffuser. It contains calming pheromones that mimic the hormone they leave behind when they rub their face on something. Perhaps one of the most important tips for preparing your cat for holiday visitors, above all else, stay calm. Cats can pick up on our moods, so if you’re stressing, they’re stressing. Basically, if you’re feeling all wound up and worried about how your cat will react, you’ll end up self-fulfilling that prophecy. Instead, exude a calm, cool, and collected attitude leading up to and on the day of the visit. Preparing a cat for holiday visitors is, in my opinion, more of a challenge than prepping your dog. In my experience (consisting of 9 cats and 5 dogs over the last 20 years), my dogs are crazy for a few minutes, then they relax. My cats, on the other hand, either go into “pet me” overdrive or completely vanish off the face of the planet! Using these tips has really helped me avoid total kitty meltdown over the years. I hope they help you, too! 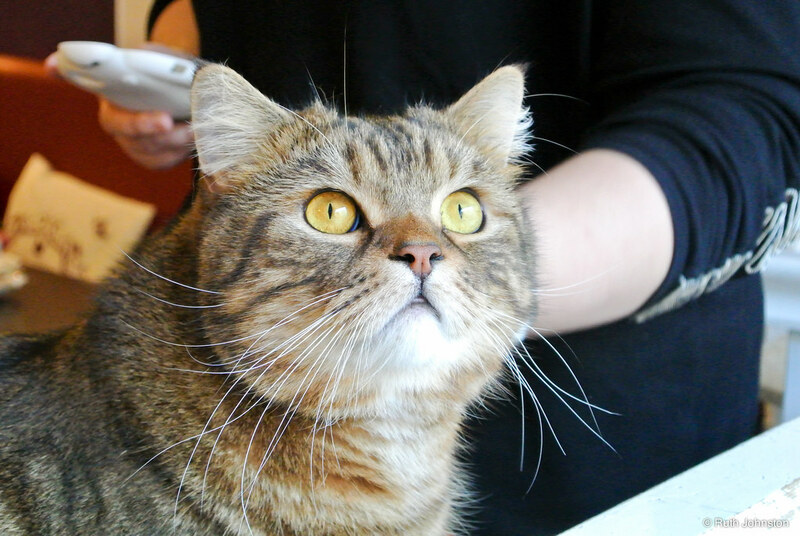 Do you have any other tips to help prepare your cat for holiday visitors? Share below!